Apple’s online store has been brought down as the team in Cupertino prepares the new pages tablet fans around the world having been waiting for. 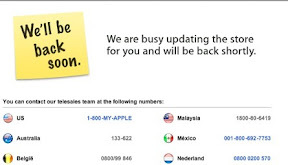 The Apple Store went down shortly after 10:00AM ET, and we don’t expect it to come back up until shortly after 1:00PM when Apple finally lets the cat out of the bag — not that’s it has really been in the bag for the past few months. Stay tuned to iamthereforeipad.com for all the latest iPad 2 news as it breaks.